Thirty people died in the blaze, and about 140 are still hospitalized. BUCHAREST, Romania — Romanians wept, cursed and prayed Sunday as they mourned the victims of a fire in a nightclub, while doctors warned the death toll could rise “significantly” because so many of the injured have severe burns. As the nation entered its second day of mourning, thousands paid their respects at the Colectiv nightclub in Bucharest’s 4th district – the scene of Friday’s fire that so far has killed 30 people and left dozens badly burned. In a separate show of grief, thousands walked silently through the capital city of 3 million Sunday afternoon, carrying flowers and photographs of the dead. About 140 people are still hospitalized around the Romanian capital. Of those, 90 are in serious condition, said Raed Arafat, an emergency situations official. He said the death toll could double. Treating victims of a nightclub fire is more complicated than treating someone for a localized burn, Arafat said. Ioan Lascar, a doctor at the Floreasca Emergency Hospital, agreed that the death toll could rise “significantly” because so many of the injured have severe burns. Lascar said the emergency hospital had performed 11 tracheotomies over the weekend to help victims of the accident breathe because they had suffered burns to their lungs. The procedure involves an incision to the windpipe, after which a tube is inserted which is connected to a ventilation machine that provides more oxygen to the lungs. 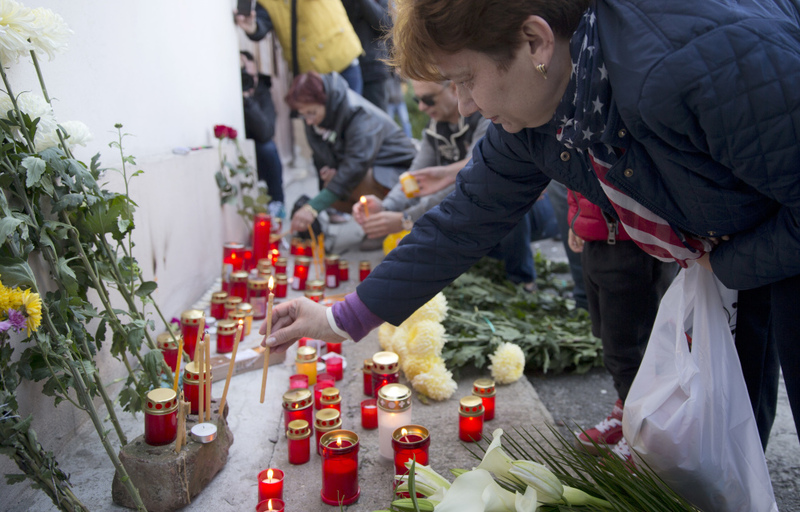 As doctors announced that three more people had died Sunday, mourners gathered outside the shuttered club, some weeping, others standing silently, apparently dazed by the tragedy, the biggest of its kind in Romania. Working journalists and police officers appeared visibly moved by the outpouring of grief and emotion. People laid down white and yellow chrysanthemums, one wrapped in a musical score, and placed red and white candles to create a sea of tiny flickering flames, in an echo of the inferno that erupted at the basement nightclub in the shabby four-story building during a rock concert with the band Goodbye to Gravity. Meanwhile, forensic experts began the first autopsies of victims. Early forensic results point to carbon monoxide poisoning, smoke and toxic gas as the main causes of death, Romanian news agency Mediafax reported.